Enter now to win a copy of Dinty W. Moore's new book "Dear Mister Essay Writer Guy." Dinty W. Moore likes puzzles. Difficult ones. That’s what the king of the personal essay says each new writing project is. As founder of Brevity magazine, a nonfiction author and director of creative writing at Ohio University in Athens, he should know. 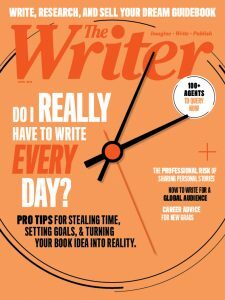 In a profile in the December issue of The Writer, Moore talks about the unconventional side of craft. But first, Moore says, writers need to learn traditional narrative. When you are clogged and stupid and weary, and you feel like every sentence you eke out is fatuous and literary and homiletic and sermonish and stentorian, and it feels like your stuff is stiff and officious, and you cannot ever imagine finding the verve and zest and fury and pop and silly of your work at its best, what do you do? Clogged and stupid and weary pretty much sums up my artistic process, except for the occasional bouts of being fatuous, homiletic, stiff and officious. Thank you for the reminder. What do I do? Besides self-loathing? Sometimes I just sit and draw pictures. If you like puzzles a la Dinty W. Moore, you may also like contests. Here’s a chance to enter one. Enter your information below to win Moore’s new book, Dear Mister Essay Writer Guy: Advice and Confessions on Writing, Love, and Cannibals.